What About Directivity vs Dispersion? Fred, the sound man, in spite of being as strong as an ox, and an expert driver, (he once came in second at the Marty Robbins Steer Wrestling and Go-Kart Grand Prix in El Paso) develops the annoying habit of turning everything you say into a discussion of sound reinforcement. Seeing as how the two of you are cooped up in Fred’s 2002 Econoline van for the long drives between one-nighters, your nerves are beginning to fray. Realizing the futility of your cause, you try not to think about food as Fred rambles through town without realizing he’s passed the one and only all night eatery. “Think of a speaker as pivoting from side to side on its vertical axis and tilting up and down on its horizontal axis. 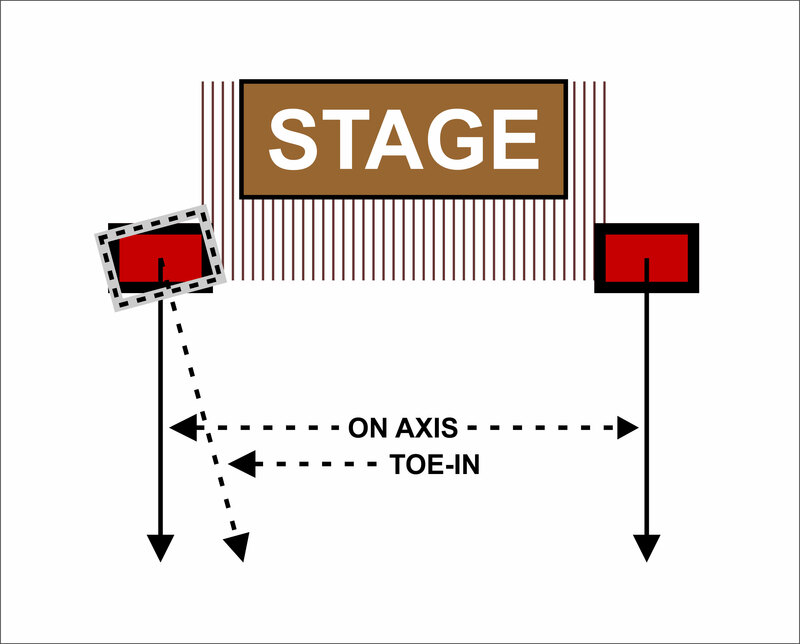 The spot directly in front of the speaker (on-axis or at 0 [zero] degrees) serves as the point of reference in discussions of coverage angles and/or sensitivity.” He continues, “A speaker’s angle of dispersion is measured in comparison to both its horizontal and vertical axes. 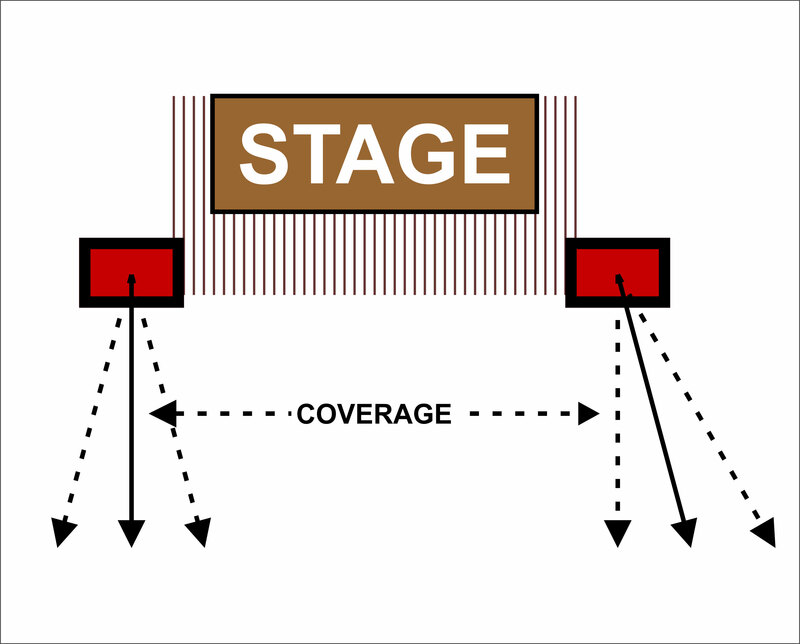 Coverage angle describes the area blanketed by the sound pressure waves produced by a speaker. The edges, or limits, of the area are defined by a 6 dB drop-off in sound pressure from on axis. “Q (the directivity factor) is a ratio obtained by complex mathematical calculations involving the relationship of a speaker’s direct radiated energy to its total radiated energy. When measured on axis, Q (which is dependent on frequency) is used to determine a speaker’s suitability for a particular application. “Sensitivity is the level of sound pressure directly in front of the speaker (on axis), at a given amount of power, at a given distance (Example: 100 dB @ 1 watt @ 1 meter). Most speaker specifications pertain to sensitivity. “That’s exactly right.” Fred says, “Sound from a speaker can be divided into two types: direct sound which emanates from the cone or horn, and reverberated sound which is reflected off of the walls and other surfaces within a room. As you move further away from the speaker, direct sound grows fainter. The point at which the SPL of reverberated— or reverberant— sound is equal to that of direct sound is called the critical distance. Coverage angle differences and other factors mean horns and cones can have different critical distances. Beyond the critical distance is an area known as the reverberant field in which there is no further decline in sound pressure levels. In the reverberant field, the SPL is influenced more by the speaker’s efficiency than its sensitivity. “You're in a reverberant room; let’s make it a hockey arena. Near the speakers, the sound is good, but as you move farther away, it’s bassy. The horns are more sensitive than the woofers. The woofers are more efficient than the horns. To achieve a flat frequency response (in which the bass, mids and highs are at the same volume) the horns have been shelved at the crossover, meaning the signal going to the horns has been adjusted to compensate for the difference between their sensitivity and that of the woofers. The on-axis SPL of the horns and woofers is equal. The woofers’ critical distance is 20 feet and the horns’ is 30 feet. Beyond 20 feet from the woofers (in their reverberant field) there is no further reduction in their SPL. At 20 feet from the horns, you’re still hearing direct sound which, as you move away, continues to decrease (according to the inverse square law) until you reach their critical distance. To be heard as easily as the bass frequencies, the mids and highs require more and more power. Finding a half-eaten bag of barbecued pork rinds under your seat, you say, “Tell me more,” and tuck hungrily into your snack. You ask, “Does anybody design and build speakers that are sensitive and efficient?"